Song Ta, 'Why do they never take color photos? ', 2015. Courtesy of Song Ta. Song Ta, 'Why do they never take color photos? ', 2015. Artwork fabrication. Courtesy of Song Ta. Zheng Bo, 'Socialism Good', 2016. 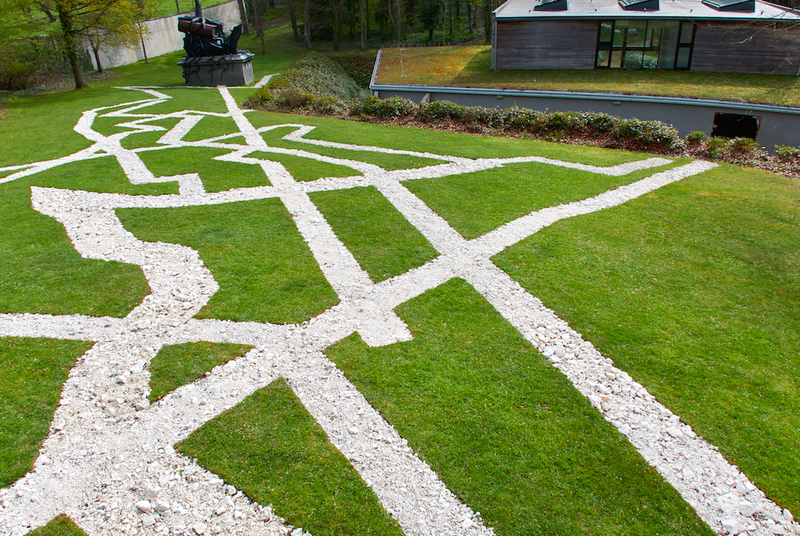 Courtesy of Cass Sculpture Foundation. 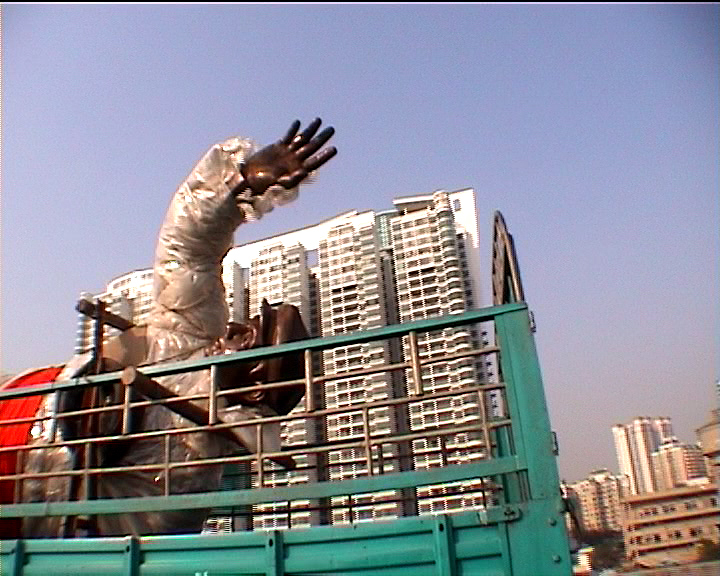 Cao Fei, 'Father', 2005 (film still). Courtesy of Cao Fei. The ‘beautiful disorder’ of the Forbidden City and the Yuanmingyuan (Garden of Perfection and Light) was first noted by the Jesuit painter Jean Denis Attiret in his 1749 account of Chinese architecture. Confessing that ‘since my residence in China, my eyes and taste are grown a little Chinese’, the missionary admired the pleasure gardens’ ability to provoke violently opposing sensations in the viewer: the calm of beauty and the energy of chaos. 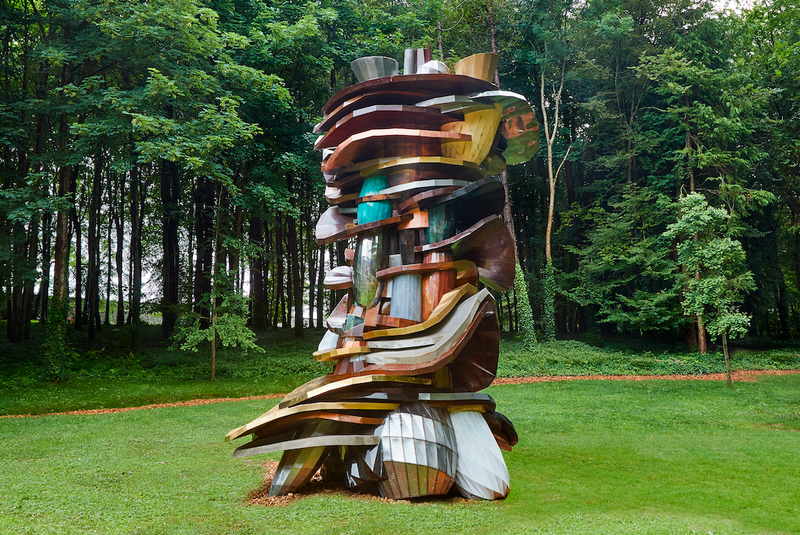 It was an observation that would influence the design of ornamental English gardens such as that which now hosts an exhibition of contemporary Chinese art at CASS Sculpture Foundation, in leafy Sussex. Landscape aesthetics seem like an oddly anachronistic starting point for a survey of emerging art from China: deploying an Old World commentary on the Oriental garden that salutes its follies and theatrical framings of nature, Attiret’s report positioned the garden as microcosm for the society on which he was, obliquely, reporting. More pertinent, perhaps, is the relationship between the garden and expressions of heroic nationalism implied by his appraisal of the Emperor’s palace and pleasure gardens. 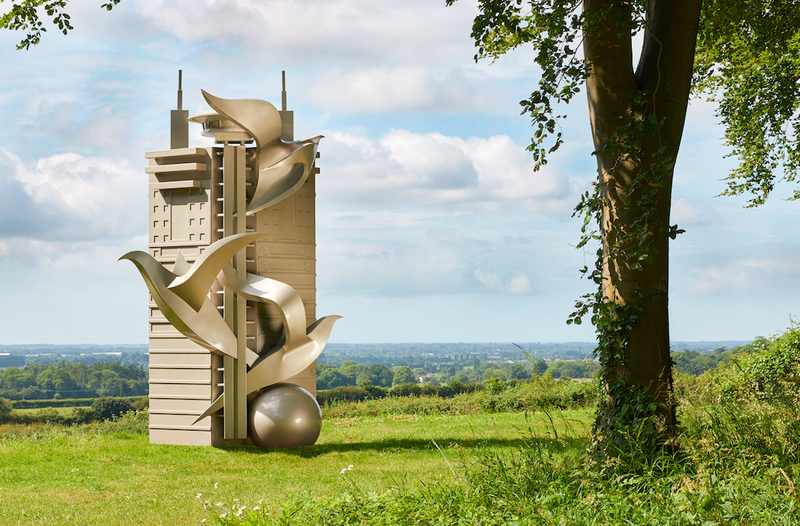 To make outdoor public sculpture is to monumentalise, or to comment on monumentalism. We associate the form with memorials to war, heroic individuals, or national leadership. Much of the work on show at CASS addresses this tendency. 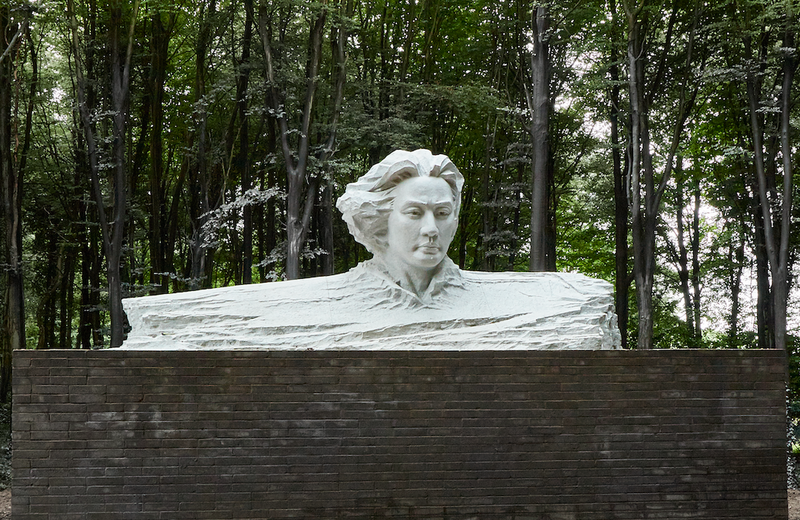 Song Ta, an artist from the factory city of Guangzhou in southern China, has transported a vast bust of Mao to the English woodlands. It shows a boyish leader with windswept hair and pouting lips, a version of a sculpture which is widely found in China but looks strange to those of us familiar only with Mao’s later portraits (such as that appropriated for Warhol’s screenprinted Mao, 1972). Ta has painted the surrounding trees stone grey to match the colour of his Mao, creating an antic photo opportunity for onlookers. Likewise, sisters Cao Fei (interviewed in the June 2016 online issue of The White Review) and Cao Dan reflect upon the history of monumental sculpture in two video works about their father, the social realist sculptor Cao Chong’en. 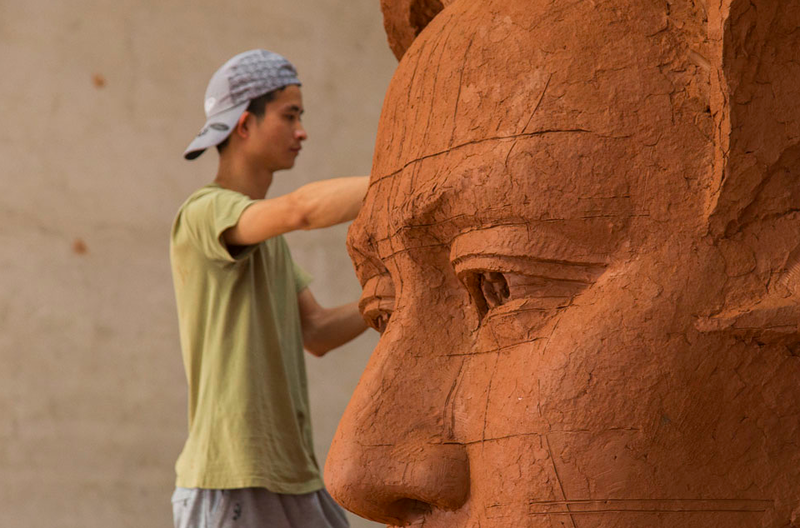 His bronze statues of Mao from the 1970s are encountered across China; in the post-Reform and Opening-up era, Chong’en makes effigies of another national hero, Bruce Lee. Contemporary Chinese art has – in the reductive but useful narrative that art historians are now beginning to complicate and extend – a relatively short history. It is generally taken to begin after the end of Mao’s Cultural Revolution upon his death in 1976, and to have expanded following the ‘open door’ economic reforms of 1978 that set in motion China’s shift into a globalised, industrial economy. In the new century, particularly, the powers that be have allowed contemporary art to flourish with relatively little intervention from the central government. The consequence is a rapidly developing institutional, curatorial, and critical network around a group of artists born after Mao’s death and labelled the ‘ON/OFF’ generation by Philip Tinari, director of Beijing’s influential Ullens Center for Contemporary Art. The sixteen works at CASS respond to this cultural history as much as to their pastoral setting as a site of overlapping contradictions. Strung amongst the trees, the Inner Mongolian artist Cheng Ran has constructed a second, artificial sun that casts false shadows through a lacy canopy of leaves and towards Shanghai-born artist Xu Zhen’s arrangement of pathways in a pattern that resembles a Zen garden. The subsoil here is political: rather than a site of tranquility, the pathways trace protest routes through Tiananmen Square. Near the entrance to the site, a rectangular bed of red and yellow flowers spell out a 1950s slogan, ‘Socialism is Good’. 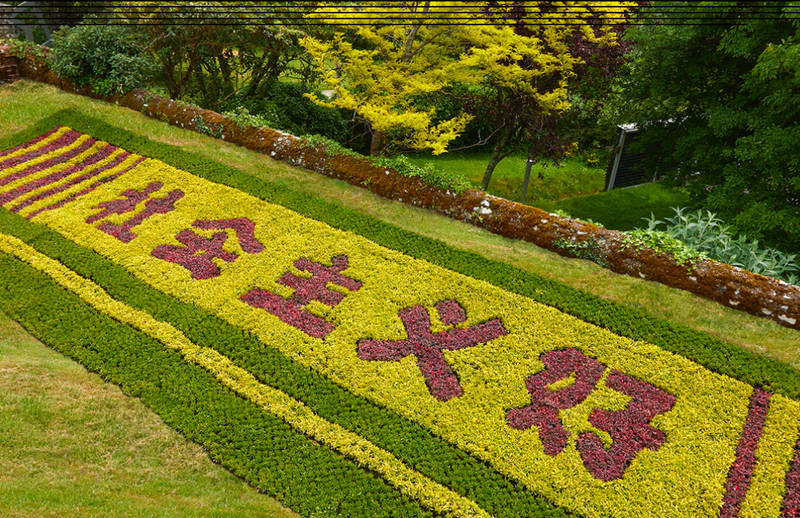 As the artist Zheng Bo anticipated, stray grasses and weeds have begun to sprout among the flowers, corrupting the Chinese characters and the message they carry. While the early years of Chinese engagement with the history of Western contemporary art was initially fraught, with limited access to global trends resulting in a ‘time lag’ of influence as artists attempted to catch up with the revolutions in art theory that had passed a closed China by, these works illustrate how methods of critique and détournement have been woven into a new cultural context. 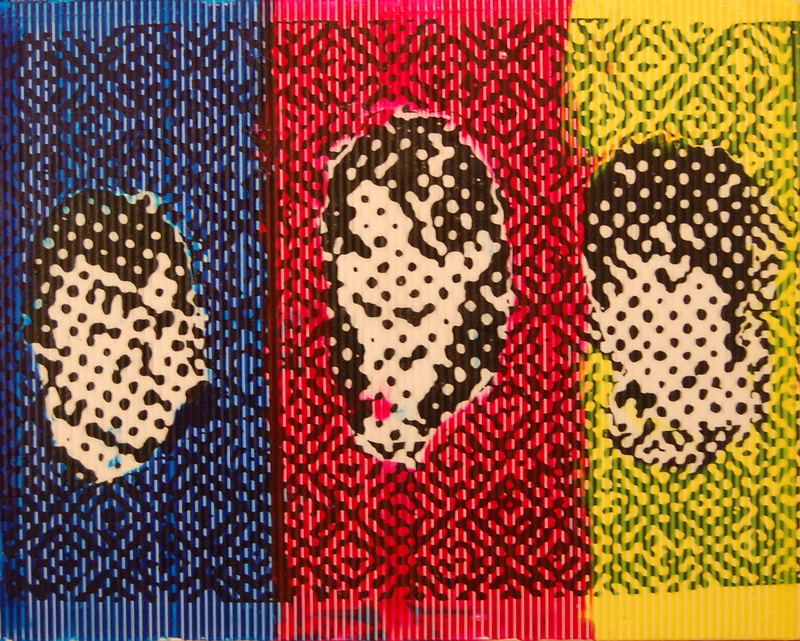 Yet it might also be too easy to see what we want to see in the work of contemporary Chinese art. Cao Fei and Cao Dan have consistently rejected readings of their work as critique, despite the eagerness of European and American journalists to characterise it as such, and have spoken of the ‘great influence’ of their father’s faithfully Socialist Realist work under Mao. The notion that Chinese contemporary art engages with traditions prior to the liberalisation of the country contradicts the comfortable Western narrative that art flourished only with exposure to non-Chinese practices (whether cultural, social, or economic). That troubling underlying assumption is apparent in the fact that Western institutions – and the European and American secondary art market – have traditionally championed artists who were seen to dissent against the Chinese state, with Ai Weiwei as the most obvious example. The impression is that Chinese artists offer the West an effective means of implying their opposition to the organisation of the state from which they emerge, a propaganda by proxy. While there is no doubt that censorship continues in China, and there are myriad stories of the steps that institutions, media organisations, and artists need to negotiate it, it remains true, according to Asia Art Archive researcher Anthony Yung, that it is much misunderstood in the West. He suggests that the ‘contemporary Chinese artist has already learned to play the game very well.’ For those who can be seen to be outspoken, without suffering the consequences, there is a major payoff: international attention, and access to Western funding. It’s a curious tightrope. 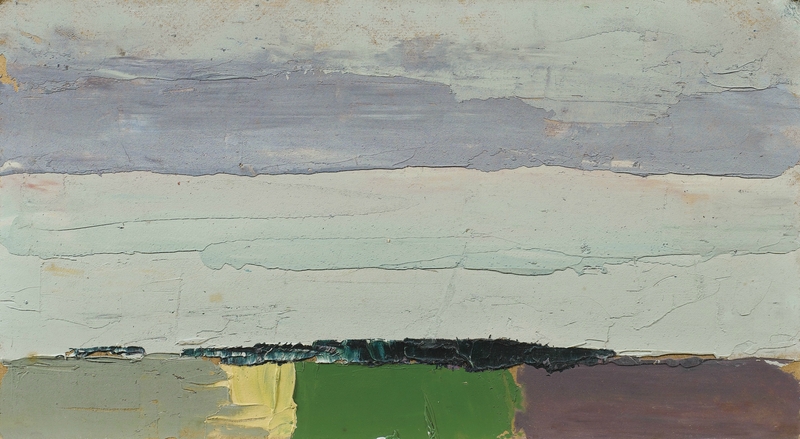 Chinese art specialist Karen Smith suggests in her book As Seen 2 (2013) that contemporary Chinese art is unmoored from a consolidated art history, creating an ‘anything goes’ atmosphere. ‘Today, in terms of the cultural sphere, there are, for example, no museums where an overview of modern and contemporary art can be seen.’ Smith explains. ‘And there are too few books on the evolution of China’s contemporary art forms; not a single tome viewed by consensus as objective or factually reliable.’ Whether this is a freedom or constraint, the situation is set to change with the opening of new museums in the region, the most prominent of which is M+ in Hong Kong, a contemporary art museum designed by Herzog & de Meuron and scheduled to open in 2019. In advance of its opening, Swiss collector Uli Sigg, a man who has amalgamated the world’s largest private collection of Chinese contemporary art, donated around 1,400 works to the new museum. With consolidation, a canon. This article is an online exclusive from August 2016.